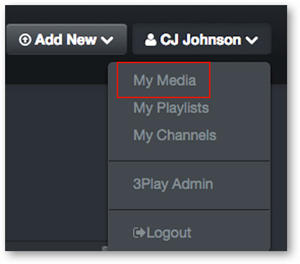 Once media has been uploaded follow the steps below to request captions within MediaSpace. Before requesting captions it is a best practice to know if your MediaSpace Module autoApprove configurations are or are not enabled. When a user clicks Request Captions for a video (see step 6 below), what happens next depends on how the MediaSpace Module Configuration Options were set up…. - If autoApprove is enabled for the module, the caption order will be immediately sent to 3Play for processing and no further actions are required. - If autoApprove is not enabled for the module, the caption order will move to a pending state and then must be approved by a user role with approval access enabled to complete the request process. Click on the video you want captioned. After selecting the video, click Actions located at the bottom righthand corner of the video and from the drop down menu that appears click Edit. 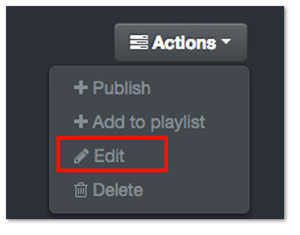 On the Edit page, click the 3Play tab to view an order form where captioning services can be requested. Note: If captions have already been requested for this video, the status of that request will replace the order form. Once a turnaround service level has been selected click Request Captions.